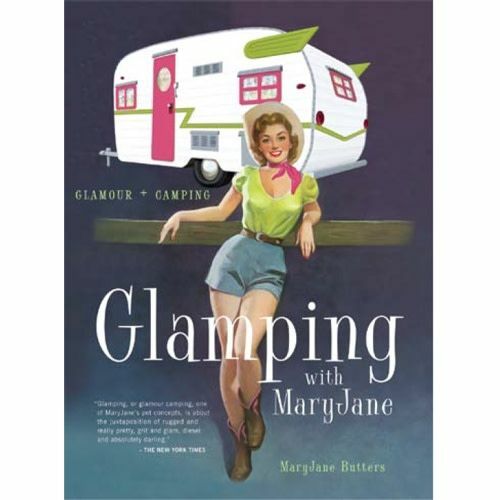 A book after or own hearts - "MaryJane Butters’ go-to guide for putting glamour into camping." Perfect for the glamper in your life. Glamping—unleashing your inner wild while wearing a pair of fishing-lure earrings—is for every woman (or man!) who ever had a get-away-from-it-all fantasy (with a few frilly embellishments thrown in). Learn about the never-fail campfire, cooking with cast iron, how to change a flat, and much, much more. Follow the growing Glamping movement at maryjanesfarm.org and nationalglampingweekend.com. Like the infamous Calamity Jane, who said, “I figure if a girl wants to be a legend, she should go ahead and be one,” MaryJane Butters coined the term glamping years ago when she founded her unusual Idaho canvas wall-tent bed & breakfast, which was featured in The New York Times Magazine and Travel & Leisure as “the place to be.” Legend status achieved, MaryJane lives in Moscow, Idaho, where she runs her many businesses, which include a successful organic farm, product lines, a bed & breakfast, and MaryJanesFarm magazine. This is her fourth book.